Are you paddling hard out just to feel like you are only just keeping up or maybe not even? Got that sinking feeling? Not enough stock? Not enough time? Its such a busy time of the year. Not only do we have markets and shops to keep stocked but the online business starts to really take flight with Christmas just around the corner. I was researching for my next post last night when it occurred to me the last thing I would want to hear about at the busiest time of the year is about more places to sell my wares that would be added to the list that is already stressing me out! SO ..... I promise that in January when I am much more optimistic and over the Xmas rush that I will do a post on Online Opportunities! But for now I thought tips I follow to keeping on top of things was much more pertinent to the time of year! Remember I am a sewer, so it is from my perspective that I write, although I am sure this would apply to some other mediums as well. Tip 1 - Preparation - Preparation - Preparation! You can never be over prepared! I have days when I have nothing urgent that has to be done (not in Nov or Dec of course) where I simply sit and prepare the little things I know I am going to need to put a final piece together. Things like cutting up fiddly felt pieces and those little jobs I hate doing and would rather have ready because it slows me down if I don't. If I have a bagful ready it is sooooo much quicker and easier! Make sure you have ordered in all the fabric, binding, ribbon, thread etc you are going to need because I guarantee that express trip to Spotlight will not reward you with the one thing you desperately needed!!! My sister taught me this one. It's really the start of a production line. Instead of making each item in one day I have a cutting out day. All I do is choose fabrics, cut out pieces and leave piles around my sewing room for working on another day. This is also the day I iron pieces and pin everything together. Anything that could hold me up once the machine starts going is done on this day! Go hard out! You feel great when those pre-prepared piles start to look finished! Don't worry about finishing touches - that happens later. This just gets the bulk of the work done. Now you can add embellishments or stuff your work or sew it up. This is the night time work I do in front of the telly. Mindless and you can still understand what is happening in your fav programme. Mel from Wildflower Designs had a post about this the other night - Is It Appropriate To Craft In Public? I say absolutely! If you have bits to do that are easy to carry around then why not? Often I will have something in my pocket or bag that is small and discrete - usually just sewing up. I just hate the idea of wasting precious time doing nothing! Tip 7 - Keep Blog Posts Short and Simple! Less is more at this time of the year! (My own post excluded of course!) If you feel you don't have time to write a blog post then there are lots of people who also don't have time to read it. Keep it short and simple and informative, with lots of pics, every few days to stay in the loop. Tip 8 - Enjoy what you do! For most of us 'making handmade' does not pay the bills. It started as a hobby and probably still is. So it should be fun! It may stress you out but you know you could make the decision to cut back if you had too. However if you are like me it is not the thing I would like to cut back on! Make sure you eat well, drink loads of water and sleep well. Try not to dream about the next stall set up or what you will write in your next blog post (as I was doing last night). Instead relax .... it's meant to be fun! Remember we all enjoy handmade and want to spread the word so keep doing what you are doing but tweak it a bit if it isn't working for you. But whatever you create - keep doing it! Its worth it! 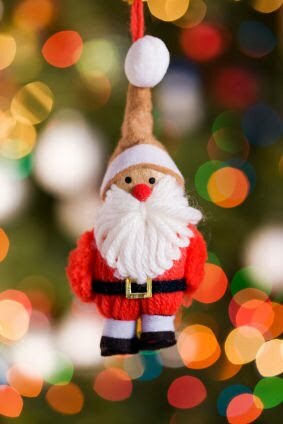 PS: Please remember that all Christmas Ornaments should be posted to swap partners by December 1st in time for Christmas. I agree, making Handcrafts is fun. Timely advice.. something for everyone.